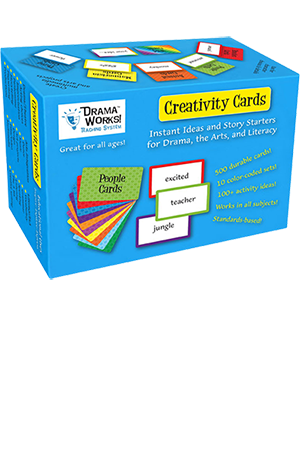 Bring new life to your theatre games and improv exercises with these 500 engaging and durable cards! The 10 color-coded categories give 50 ideas each for people, animals, creatures, things, emotions, personalities, mannerisms, activities, settings, and objectives. With bonus ideas on many cards, there are more than 1300 choices provided, plus the Wild Cards to add your own ideas. Discover instant starting ideas, acting choices, and details for theatre games, improv, storytelling, mime, playwriting, and character development. The cards also inspire creative choices for writing, dance, music, and art projects. Read more... Acting and guessing words on the cards expands students’ vocabulary too. The 3” x 5” size with large print is readable from across the room, yet small enough to comfortably hold in your hand. The durable box includes tabs for easy organization and comes with 100 activity ideas for arts education and literacy development. The cards were designed to align with the National Core Arts Standards, Texas Theatre Standards (TEKS), and Common Core for ELA. You’ll get years of use out of these cards, challenging students to higher levels of creative expression and vocabulary development! NOTE: Due to the weight of this item, your invoice will include a $3.00 Heavy Item Surcharge. Teach standards-based theatre and literary terms for students of all ages with these 300 engaging and durable cards!